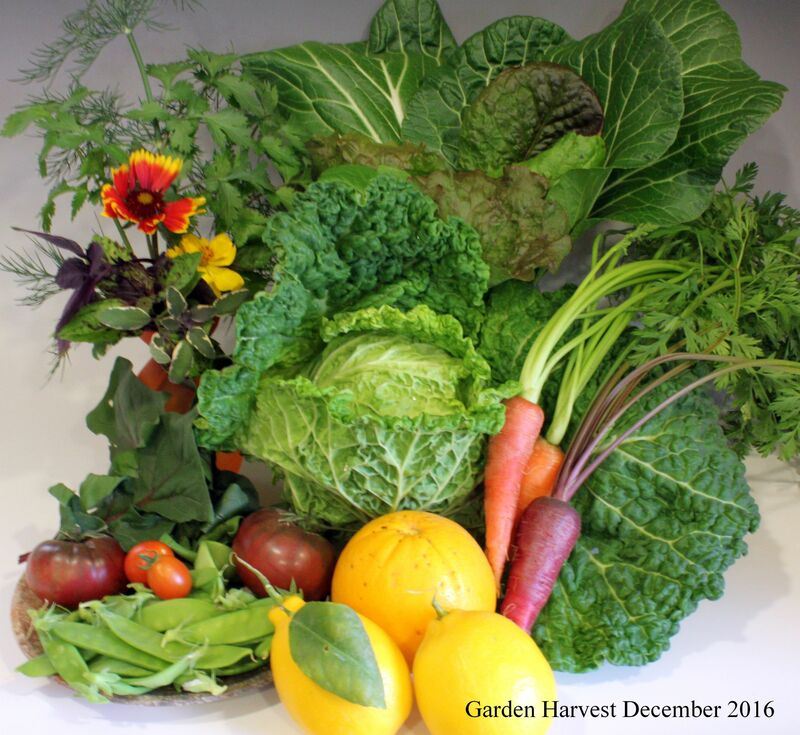 The cooler days of December has brought with it the winter harvest of snow peas, cabbage, carrots, bok choy, lettuce, tomatoes, cilantro, spinach, pomegranates, lemons, tangelo's and tomatillo's. I was finally able to grow and harvest tomatillo's, and it is always a good year when you have a new success. I have protected the tomato plants from the cool nights and they continue to produce, so this is another first for me to grow and harvest tomatoes in the winter. I have several new tomato plants that are ready for transplant once the threat of frost has passed. The last of the sweet and hot peppers were harvested in early December. The pomegranates have all been harvested and the leaves have dropped. They should start re-leafing within a month. The cauliflower and broccoli are huge, doing great, and should start showing heads soon. The nasturtiums are getting big but have not yet bloomed, but the gaillardia, cosmos, and marigolds are still blooming and keeping the bees happy. I started my spring seeds indoors in December and happy to report that my peppers, zucchini, cabbage, okra, cucumber and eggplant seeds sprouted within a week and now I am getting them transplanted into larger pots. These will all be ready for the outdoors mid to late February after the threat of any frosty nights has passed. Successful growth and harvest of Toma Verde tomatillo. The snow pea production has begun. Finally the green worms subsided with the cool weather and all the leafy greens recovered. The Zuni tomatillo plant succumbed to the cool weather and was removed. Seed starting - If you are planting from seed, then you need to get some of your spring plants started indoors for early transplanting. This includes peppers, tomato, and summer squash can all be started indoors. Use organic potting soil and you will want to provide a source of light (either natural or fluorescent) and a heat pad for seed starting is recommended for faster propagation. Sow directly outdoors your lettuce, onion, peas, radish, carrots, cabbage, beets, cauliflower, chard, spinach, and turnips while soil temperatures are not above 45 - 50 degrees. Pruning - Now is the time to prune the trees that are dormant (this does not include citrus). I will be removing dead branches and trimming back my pomegranates and almond tree. Fruit trees should be pruned in late winter before bud break. Don't forget about your grapes, they will need pruning depending on the type either cane or spur pruning. Most trees, with exception of peaches, should never be pruned more than 1/3 of the plant of tree. Remove dead branches, any cross branches and branches that don't create a 45 degree angle from the trunk of the tree. Peaches typically require an aggressive prune each year. 1. Time to plant bare root fruit trees (apricot, plum, apple, peaches). Choose low chill hour ( 1hr at or below 45 degrees), 250 or less hour varieties for best results. 3. Add compost and volcanic rock to your garden soil. 4. Add mulch to bare soil. 5. Prune fruit trees before bud break. 3. Don't prune frost damage, wait until February. 4. Don't water your lawn at night. • Seeds - beets, bok choy, broccoli, cabbage, carrots, cauliflower, chard, collards, eggplant, kale, leeks, lettuce, mustard, green onions, peas, potato, radish, spinach and turnips. Use companion planting to control pests, prevent disease and improve vegetable growth and flavor. There are 3 plants that are good companions for almost anything. Lavender helps ward off insects and attract pollinators. Nasturtium is an edible flower plant and also works as a trap crop to keep insects away from other plants. Legume or pea plants have nitrogen fixing bacteria, so they actually improve the nitrogen in the soil that benefits all the plants. Refer to the planting guide for individual companion planting information (first column comment; place cursor over the red triangle in the upper right corner of the cell) and full companion tables are included in the Vegetable and Fruits sheets. A: Stunted plant growth can be a result of a Phosphorus and or Nitrogen deficiency, and can also be caused by salt build-up in your soil. The Nitrogen and Phosphorus deficiency can be addressed with a fish emulsion/seaweed fertilizer (see recipe from my planting guide sheet on organic fertilizers). The salt build-up would be noticeable by a white crust that may form on the surface of your soil. This is a typical problem in the desert and can be compounded by drip irrigation that does not help leach or dilute the salt at the surface of the soil. To leach the salt you can simply water with a hose and gentle sprayer with a good amount of water (2 inches over 2 hrs in the literature). Gypsum and soil Sulphur can also be used to counteract salt build-up by lowering the soil pH. Another way to combat possible nutrient deficiency or ability of your plants to get the soil nutrients, especially if you have some salt build-up, is to treat your soil or plants with Epsom salt.Studies show that magnesium and sulfur, two naturally occurring minerals that are major components of Epsom salt, may help plants grow greener with higher yields and more blooms. Magnesium creates an environment conducive to growth by helping seeds to germinate, increasing chlorophyll production and improving phosphorus and nitrogen uptake. Sulfur is also a key element in plant growth, helping produce vitamins.